Turn an ordinary loaf of bread into a piece of warm, cheesy, gooey piece of heaven with this cheesy garlic bread recipe. Mix together butter, garlic and cheese until combined. Spread a layer on both sides of baguette halves. 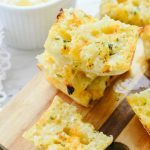 Cheesy Garlic Bread was originally written by Leigh Anne Wilkes at https://www.yourhomebasedmom.com/cheesy-garlic-bread/.